With Valentine’s behind us, let’s take a look at the new dating order emerging in our era of social media. Take a young couple in courtship. Chances are that these days the romance will play out on Facebook or Twitter, in a virtual arena of known (and unknown) bystanders. As the pair’s intimacy grows, they’ll share passwords (to e-mail accounts and photo-sites) as it’s the new way of gaining love and trust. And should their love falter, the breakup will be defined by the Web as well. In the past, it was possible to cut (literally) someone out of the picture and get on with your life. But these days where the internet’s concerned, it’s practically impossible to sever ties completely. Status updates, tweets and wall-writings will continue to get back to you and digital pictures of you and your ex will still abound. It’s thanks to the interconnectedness and uncontrollability of social media that it’s now harder than ever to leave a relationship behind. The French artist Edgar Degas (1834 – 1917) was in the habit of poring over past pictures. An influential painter, printmaker and sculptor, Degas had an academic training, attending classes at the Ecole des Beaux-Arts (France’s top official art school) and making studies of the Old Masters. He might have gone down a traditional art path, were it not for a chance meeting with Edouard Manet (1832 – 1883) who turned him into a devotee of modern-life subjects. Since he came from a comfortable background, Degas didn’t rely solely on selling pictures for his income, so had some freedom when it came to choosing subjects. Perhaps that’s why almost all of his portraits show friends and family members. Our picture (Edmondo and Thérèse Morbilli c. 1865) shows the artist’s sister and her Neapolitan husband. 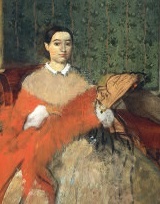 Though it’s set in a living room (Degas liked working indoors) and appears posed, he avoids a structured composition becoming stilted in a number of ways. See the spontaneity of the couple’s casual poses: she’s raising a hand and he’s turning towards us, hand on hip and left leg bent on the back of the chaise. Degas deliberately didn’t use the body positions of classical statues and old paintings, thereby making his subjects look more real and familiar. Notice too the cropping (cutting off) of the dress on the left, adding to the impression of a snapshot. What’s interesting here is that we see how Degas puts off finishing a painting, liking to go back to it again and again (he’d even retrieve already-delivered pictures to rework them). Sometimes it happened that he never completed a work, as is the case with our portrait (it was in his studio at the time of his death.) See Thérèse’s dress and shawl, as yet undefined areas of color where he’s scraped and rubbed paint off the canvas. The darker lines in these parts suggest changes Degas planned but never got round to. I can only imagine that Degas’ habit of returning to a picture was productive for him. It allowed him to perfect it in bits, such as the fully finished faces, detailed and expressive. But for people seeking to move on from a relationship, going back to pictures and profiles on the internet might be less fruitful. Sure, there’s the sense of keeping tabs on someone and the chance to sate curiosities, but ultimately it’s unhelpful, serving only to string out and entangle a break-up even more. 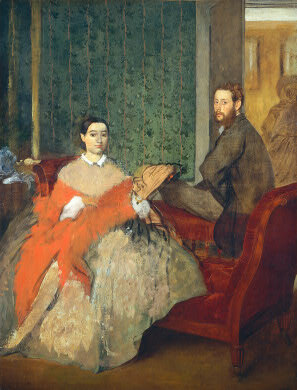 I don’t know if anyone ever told Degas to put down his paintbrush, but for those of us ending a romance, it’s probably best practice to change the passwords, stop the posting and get a whole new e-mail address. I adore this blog Aleid, I read it every night on my bus ride home from work. It’s thought provoking, topical, beautifully written I learn loads every time. Thank you for giving me something to look forward to every day!